In honor of Tau Day, you might want to read the Tau Manifesto, listen to what tau sounds like or to Vi Hart’s “A song about a circle constant”, or visit Pi Bar and get a slice of pizza and a beer for $6.28. Also, circulating around the twittermathosphere is the claim that today is the “perfect day” because 6 and 28 are both perfect numbers. I was looking at the list of US cities by population on Wikipedia yesterday, because I noticed that Sunnyvale, a suburb of San Jose that I had occasion to go to yesterday, had a surprisingly large population of 140,095. There are a lot of places like this in California — despite having about 12% of US population, it has 64 of the 275 largest cities (all those with population above 100,000), or about 23%. Of course census data shouldn’t actually be taken to be exact. But how many pairs like this would we expect? Because I don’t want to rewrite these numbers over and over, I’m going to rewrite that as , and plug in the numbers at the end. Now let’s invert this relationship. How many cities do we expect to have population greater than some constant ? That’s just the rank the corresponds to ;. Solving for gives . Let’s write this as $r = f(p)$. Taking the derivative here is actually the crux of the analysis, so I’ll elaborate a bit. The expected number of cities having population at least p is ; the expected number of cities having population at least p+1 is . 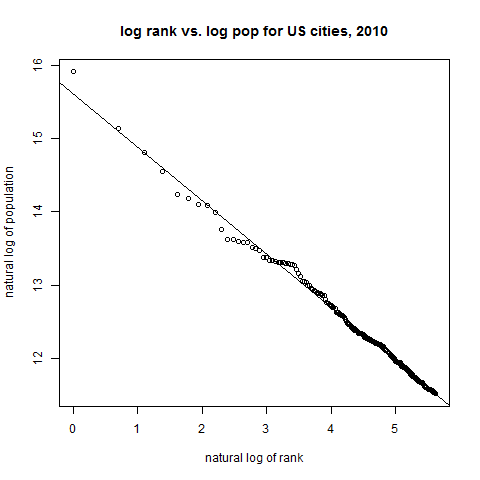 The expected number of cities having population exactly p, then, is . But varies slowly so we can approximate by . Let for later ease of notation. Roughly speaking, is the density of cities per unit population, at p. For example, if we let p = 105,000 we get that we expect 0.0034 cities of population 105,000. Extrapolating to the range from 100,000 to 110,000, we expect 10,000 times this many cities, or 34, in that population range; there are in fact 39. Plugging in the values from above, c = 100000, a = 6018207, b = 0.7287, gives 0.1924. So the expected number of such coincidences is about one-fifth; in the 2010 census it was three. Black bears have some numerical ability. From Josh Laurito, How similar are European languages to each other? Unfortunately does not include the language(s) that I’ve heard referred to as “BCS” or, somewhat more crudely, “Bosnifuckit”. That’s “Bosnian/Croatian/Serbian”, which are three very similar languages or three dialects of the same language depending on who you ask. Ownership and control at Square, at Rotary Gallop via Hacker News. Rotary Gallop is applying something like the Banzhaf power index to corporate ownership structures. DarwinTunes, in which pieces of music make baby music. William Wu‘s gallery of fractals, mostly by Paul DeCelle, and Wu’s introductory comments on fractals and brief explanations of the Mandelbrot set and Sierpinski triangle. Mike Bostock has a series of posts on visualization methods: fisheye distortion and other ways to distort plots so that when you drag the cursor over them the part near the cursor is magnified, the Les Misérables adjacency matrix, hive plots for dependency graphs, chord diagrams for Uber car service data. Nate Silver on Calculating “House Effects” of Polling Firms. Mark Dominus explains linear regression in a math.stackexchange answer. A crowdsourced survey of adjuncts reports that adjuncts don’t make much money. I’m disinclined to trust the exact numbers, but the more general results are sobering. A product rule for triangular numbers. It turns out that triangular numbers satisfy the rule (and there’s a nice pictorial proof of this); are they the only such sequence? A MathOverflow question yesterday asked for interesting mathematical documentaries. This is the sort of thing I’d usually save for the weekly links post, but I suspect this question will get more answers if I put this link here today than if I wait four days. Rick Wicklin of SAS gives Eight tips to make your simulation run faster. Analyzing the chords of 1300 popular songs for patterns,the first blog post of hooktheory, which “teaches the theory behind popular music for songwriters and musicians.” Via Hacker News. If you know some music theory you won’t be surprised, but it’s interesting. Larry Wasserman on the difference between statistics and machine learning. Why are no-hitters on the rise recently? Steven Pinker on the number of people that have lived and died in the 20th century. Five mathematical subjects that could be taught in elementary school or high school, but aren’t. Some graphs of number of births by day of year. This American Life on Chernoff faces. Gasarch examined the odds of Kentucky Derby longshots.